It is ten degrees and foggy in Berlevåg when we make port with Klassekampen's summer boat. There are no yellow, dried-out trees or forest fires here like in the South of Norway. Trees do not or hardly grow in this environment. The heat of this summer and the worst drought in 70 years seem like a distant memory on our trip along the North Norwegian coast. But here too, the signs of climate change are visible everywhere, for those who recognize them. On the tundra I see crowberry shrubs, of just a few centimeters tall, with brown and gray patches, instead of their usual green color. Last winter, it was so warm all along the north coast of Norway, and up to Spitsbergen, that it wasn't snowing but raining. It's probable this was also the case here. When the cold returns after such rain, the wet snow freezes into a thick layer of ice that damages plants. This is a problem which is increasingly common due to climate change, but little is known how this will change the northern nature. Back on the Barents Sea, the weather is calm, but a violent change takes place under the sea surface. Not only because of the king crabs introduced by the Russians which make life difficult for both fish and fishermen. Rather, a recent study by a group of researchers from Tromsø and Bergen showed that the Barents Sea has warmed so much that it now resembles the Atlantic more than it does the Arctic Ocean. It also means that many arctic fish, and other animals, will disappear from this area. The question remains: are we more stupid than a frog? The Barents Sea is one of the first places in the world where climate change has reached a tipping point. But this dramatic change was only observed afterwards. That's shocking: What other tipping points are still in store for us, and will we see those coming on time? We are like a frog put on a stove in a pan with lukewarm water. If the water warms up slowly enough, the cold-blooded animal will not feel that the temperature is rising. Eventually, it will be too late, and the creature is boiled to death. At least – that's what I thought. This parable, which is often used to express the urgency of climate change, appears to be a myth. In reality, frogs jump out of a pan when the temperature gets too high. So, the question remains: are we more stupid than a frog? Don't we realize that the world around us is changing? This may be true for some, but unlikely for the inhabitants of the polar region. The ongoing changes are too large and too obvious. Sea ice is disappearing, snow melts earlier and falls later, glaciers retreat and the permafrost thaws. The high north is warming twice as fast as the rest of the world. Do you recall the lower limit from the Paris agreement of 1.5 degrees? North of the Arctic Circle we pretty much passed that. Oil and gas extraction is not sustainable. This photo is from Veidnes outside Honningsvåg, where Equinor has planned a new terminal. Despite these clear changes, local worries are often quite different. Whether there are enough jobs for example. 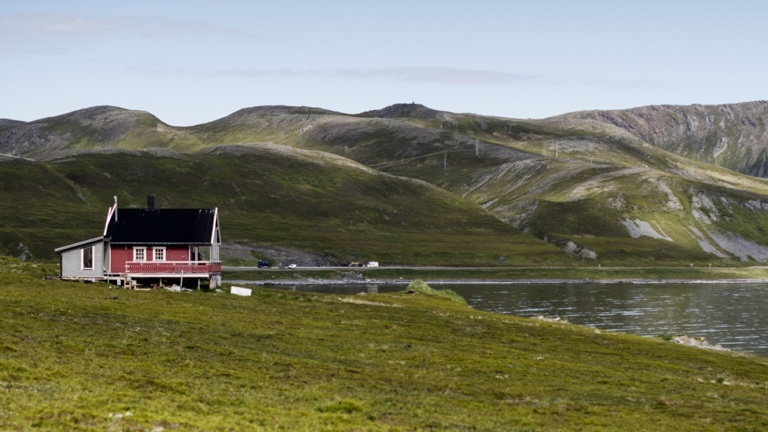 Many villages in the North, such as Havøysund, see people moving away to places where work is easier to find. Combatting this trend is, of course, the highest priority for northern municipalities. Climate change is a vast, and often elusive, problem that cannot be solved at a local level. In that respect it is understandable that the gas industry was welcomed with open arms in Hammerfest. The productivity on the island of Melkøya ensured jobs and population growth, and the city clearly prospered. It is a pity, however, that roughly 2% of Norway's total CO2 emissions come from this tiny island. And that's when the export of all that gas is excluded. The regained prosperity comes at a high price. In Northern Norway, life is closely linked to nature. Not just fishing and reindeer; Hundreds of thousands of tourists from all over the world travel up there to enjoy the beautiful landscapes. If the rapidly changing climate in the Arctic region disturbs the natural balance, people will notice this directly in their income, and it will cost jobs. Oil and gas are not a sustainable solution for the economy in the North, nor the rest of the country. There are already more proven oil and gas reserves in the world than we can safely burn. We have to get rid of these fossil fuels within 20 years. The beautiful Norwegian nature, however, can also ensure a stable income for future generations – provided we do not ruin that nature in the meanwhile.